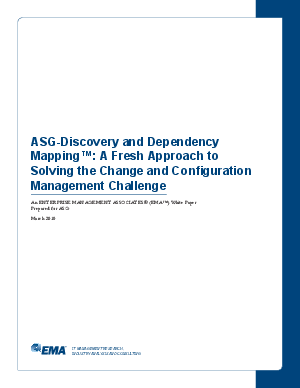 > ASG Software Solutions > How about Solving the Change Management Challenge with Discovery and Dependency Mapping? Configuration Management is at the heart of the IT Infrastructure Library (ITIL) and forms the foundation for Business Service Management (BSM). In fact, it is safe to say that neither the ITIL IT Service Management (ITSM) processes nor the BSM functions that leverage ITSM can be efficiently carried out without accurate configuration and dependency information. Lacking a clear understanding of the ways in which hardware and software assets interconnect, and which ones depend on others, IT organizations must resort to managing today's complex business services via trial and error. Gathering and maintaining accurate configuration information, particularly as it relates to applications and their dependencies, is a significant challenge for most IT organizations. This paper focuses on Application Discovery and Dependency Mapping, a relatively recent enterprise management technology which directly targets the challenges related to application configuration management.